Are you ready for the holidays?! Wheel n Deal Mama wants to help you with that! 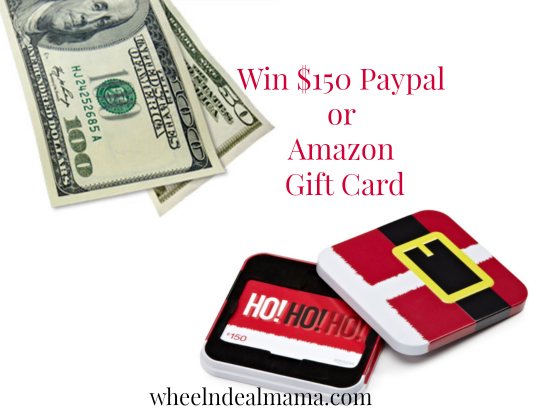 I am giving away $150 Cash Paypal or Amazon Gift Card to ONE lucky reader! YOU get to pick which one! Just in time for that final weekend of shopping! This is in addition to the daily giveaways for Amazon gift cards happening on the Facebook page! Giveaway is starting today and will end 12/18! Please share, share, share and help spread the word! If we get to 500 individual entries (as seen by the comments) I will up the giveaway to $200! If we get to 800, it will be go up to $250! So it behooves you to spread the word! Thanks for all the awesome opportunities to win! You’re awesome! Would love to win a paypal card! I would love either one but as I am an Amazon junkie I would definitely choose Amazon! Good luck to everyone! Thanks!!! I would love either but I would probably choose amazon. I’d choose amazon 🙂 Thank you so very much and Merry Christmas! I would like to be an Amazon card! I would love to have the paypal please if I win! This would be so awesome. Paypal or amazon is good for me. I’m not picky, lol. Just want to win!!!! Would love money in my PayPal! Would love the Amazon card! Amazon is my best friend!! I can’t get the comments on the flower blog to come up, but I really like the confetti one. I also saw some blue roses I’d like. Amazon!! You can get anything there!! Amazon! Thank you for the awesome giveaway! I would love this!! I used Amazon and PayPal all the time!!!! I would take either one! Would prefer Paypal over Amazon! Amazon sounds good to me! I would choose Paypal gift card. Amazon! I can buy lots of diapers with that!!! Would love an Amazon gift card! I would be happier with either!! Thank you for the chance. I love all the great things you guys do for people.you rock love this site. I would prefer amazon. Thanks for the opportunity! ! I would pick the Amazon card, hands down. Either one!!! I love both, but if I had to choose it would be Amazon. Would love the amazon gift card! Loved the confetti bouquet of flowers. Thanks for the contests! I would love the Amazon card! Any will work for me! Would love either one. Thanks for the opportunity. Merry Christmas! Either would be a great blessing! Thank you for the opportunity! Paypal, definitely. Gotta buy Christmas dinner next monday. Thanks for the chance WNDM! Thanks for the giveaway. I’d prefer PayPal. Thanks. Would love the PayPal gift! LETS WIN!!! I’d LOVE an AMAZON card!!! Would love to win the Paypal gift!! Love the opportunities you give your followers to win! This would really help out this Christmas season! AMAZON!!! TYSM and Merry Christmas! I could really use $150.00. Thank you for hosts giveaway! Paypal or Amazon would be a blessing! Amazon would be my pick! I would be sooooo happy if I won, then I would be able to give my kids a christmas, instead of santa passing us by, this year has been the hardest ever, hubby’s income was cut to 1/3 of what he used to make after losing his job of 13 years, and unemployed for 4 months. I would choose the amazon giftcard, because the toys they would love to get are on there for great prices. Would love an Amazon gift card!!!! I would be grateful for either one!! 🙂 I might be leaning towards paypal because I’d probably use it to pay off a bill or two. Thanks for the chance! I could so put this to good use. We LOVE, LOVE, LOVE Wheel ‘n Deal Mama! She is absolutely amazing and we are thankful for all of her hard work and all the time she spends to find us these amazing deals and giveaways! And, of course, we LOVE Amazon and Paypal! Bring on the money! An Amazon gift card would help me finish my Christmas shopping. Thank you for the chance to win. Amazon for sure.With 8 kids there is always a holiday or birthday to shop for. Amazon would be lovely! Thanks for chance! This is so awesome! Would definitely make my Friday night! I would prefer Paypal, but either would be great! Would love an amazon card! Would love to win this as my husband has been on workmans comp and miney has been really tight this year. Thanks for the opportunity you’re awesome! I would love to have the Paypal credit but at the end of the day either one would be a blessing. I would love to wing! Thanks for the chance. PayPal would really be appreciated. I would love to win Paypal. $150 would help out so much right now! Hoping to win! Thanks for posting all the fantastic deals! Paypal!